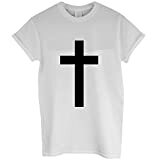 CROSS T SHIRT. Manufacturers Size Guide Chest in Inches: S – 34/36, M – 38/40, L – 42/44, Xl – 46/48, 2Xl – 50/52, Excellent Quality, Our Print Is Professional Heat Transfer Flex, Designs Are Cut On State Of The Art Plotters and Applied with Industrial Heat Presses, Long Lasting, No Fading, No Cracking. This entry was posted in Gothic Discount Clothing and tagged BNWT, CHRISTIAN, Cross, DOPE, Faith, GOTHIC, JESUS, RELIGION, RELIGIOUS, Shirt, SWAG by Vivid Dark. Bookmark the permalink.